One of the most exciting times of any young adult’s life, moving into a college dorm is a huge step for newly admitted college students. 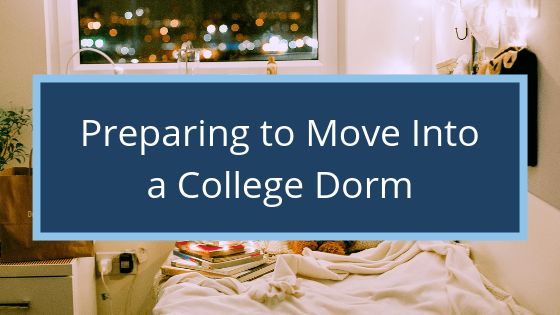 Along with the joy and excitement of getting accepted can come a bit of stress and nervousness about moving… especially when it comes to packing. But don’t worry – My Tucson Movers has put together a guide of how to pack when moving into a college dorm for the first time. The first thing you need to do when you’re preparing to pack organize. You need to make a list! Think of this as a brainstorming session – there’s no right or wrong answer. Just write down everything you can think of that might be useful in a dorm room. After you have your list, break it down into two separate lists: needs and wants. Needs are the absolute essentials that you need for your new dorm room like sheets, towels, and toiletries. The list of wants should contain everything else, from decorative items to the stuffed animal you have had since you were a baby. Look at all of the items on your “want” list and narrow it down to only a few of the items that you will want to have with you the most. Your dorm room isn’t going to be that big, and you’ll most likely be sharing your space with a roommate – the last thing you want is for them to feel like you are encroaching on their space, but you also want to make sure that you feel comfortable! If you need some inspiration for your list, check out College Board’s checklist and adapt it to your own needs. What’s the weather going to be like where you’re going to school? Maybe you’re used to the heat and don’t have much for winter clothes? Only pack what you need – there’s no reason to pack your whole winter wardrobe if you are going to college in Florida, in which case you should only bring a couple of sweaters or hoodies just in case. Similarly, if you don’t own more than a couple of winter garments but are going to school in Colorado, you have some shopping to do. The point we’re trying to make is… pack wisely and be reasonable about what you’re bringing. Look through your list and figure out what you already own and what you need to hit the store for. From seasonal clothing to storage containers and dishes, make sure you purchase everything you need. If you’re looking to save some money, you can check out your local Goodwill or consignment store to see if they have what you need at a discounted price. Also, always contact your university for specifications like bed size, electrical outlet information, and desk height to make sure the items you are buying are the right size, voltage, height, or anything else! Whether you’re planning on attending a local university in Arizona or are traveling across the country to begin your academic career, My Tucson Movers is the go-to mover near you we are ready to help with your local or long distance move! We can even provide you with full-service packing and coupons to make your move affordable. Contact My Tucson Movers online or call us at (520) 822-6140 today for professional, affordable moving services to help your transition into college life. Preparing to Move Into a College Dorm Overall rating: 5 out of 5 based on 14 reviews.